In the UK, that is. Pilot schemes to enable pharmacists to give women the Pill without the need for a GP prescription will go ahead next year. Two London primary care trusts (PCTs) have received cash to act as pilot sites to see if the scheme is suitable for rolling out across England. Women will be able to obtain the oral contraceptive after an interview with a qualified pharmacist. If the pilots are successful, the Pill could be put on the same footing as the morning-after pill, which is already available at pharmacies without direct authorisation from a doctor. Health minister Lord Darzi insisted last year that "robust" standards would be put in place to ensure that staff were up to the job. A spokeswoman for the Department of Health said: "We will be receiving quarterly updates from SHAs on improving access to contraceptive services and will be working with them to assess the success of the schemes in their areas." 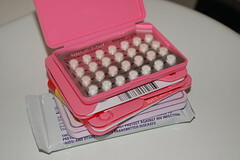 She added: "Any woman who receives contraception from a pharmacy without a prescription can still expect a full consultation with a health professional such as pharmacist or a nurse. We want to improve women's access to contraception and help reduce the number of unintended pregnancies without undermining patient safety." Needless to say, I think this is a very good idea. Start out small, evaluate as you go along, work out the inevitable kinks and tweak as needed, and see if the intervention has the desired effect. You know, reality-based health care. The percentage of women who incorrectly self-identified as not contraindicated (6.7%) is similar to the proportion of actual pill users in the US who are contraindicated for use (6%). Over-the-counter provision of COCs [combination Pill] would likely be safe, especially for younger women and if independent blood pressure screening were encouraged. The sad part is that it's hard to imagine a scenario in this country where science and the female patients' best medical interest would be considered legitimate reasons to make the Pill available over-the-counter.